As summer draws to an end in the northern hemisphere, you’re probably dreaming about where and when to vacation this year. If exploring Patagonia’s wild and rugged national parks, glaciers and incredible wildlife is on your to-do list, here’s 7 reasons to travel to Patagonia in the fall (September through to the beginning of December). Keep in mind that because Patagonia is south of the equator, you’ll be heading into springtime as the snow melts and the flora and fauna is arguably at its best! While Patagonia is known for its incredibly beautiful scenery, it’s also got an accurate reputation for having unpredictable weather and relentless winds. However, the months of September through to November bring with them less ferocious winds than in summer when they often reach up to 120 miles per hour. If you’re planning on enjoying the outdoors, aiming for the cooler but less windy conditions of these months can provide a more pleasant experience. While Patagonia is a remote destination regardless of which time of the year you go, choosing to travel before the peak season of Summer means there’ll be fewer people to contend with for a more authentic Patagonian experience. It’ll also be easier to secure bookings for tours, hotels, campgrounds and refugios (traditional mountain lodges). During the busy summer season, many of Patagonia’s reclusive animals like the puma and huemul deer retreat from populated areas to avoid facing people. So, if you’re visiting before the crowds arrive in mid-December, you’ll be much more likely to catch a glimpse of Patagonia’s incredible wildlife. To see all the different animals in Patagonia ----> Patagonia Animals. Come to Patagonia in the Fall as the snow melts and the flora awakens and it’s likely that you’ll be greeted by a colorful carpet of alpine flowers set against the snow-topped mountains. The greens are more vivid, the Chilean fire-bush is in full flower and there’s an incredible energy that’s created with this natural renewal. Although winter in Patagonia is beautiful (United States Spring/Summer time), many popular trails and national parks are closed due to inaccessibility. However, come springtime (United States Fall time), the parks reopen and you can be one of the first on trails like the popular Paine Circuit in Torres del Paine National Park. The Fiestas Patrias is a country-wide celebration of the Chilean Independence and with it, all things Chilean! It happens once a year on the 18th and 19th of September and is a great excuse to spend a bit of time in Santiago on route to your Patagonia adventure. Immerse yourself in the culture with vibrant parties, parades and traditional feasts. Last, but not least, why travel to Patagonia in the fall? To grab a bargain of course! Because there’s fewer people visiting, you can often find great deals on flights, tours and hotels to make your holiday that much more affordable. You’ll still get the same service as those traveling in peak season, just at a reduced rate and possibly with a bit of added personal service as tourism providers aren’t so busy. And, that goes for us at Quasar too! 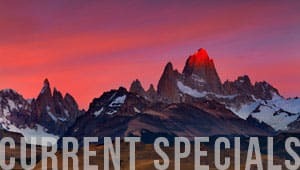 Currently, we’re offering specials on selected Patagonia in the Fall trips in September and October. For more information, on our Patagonia in the Fall travel specials, click here ----> Patagonia Travel Deals.